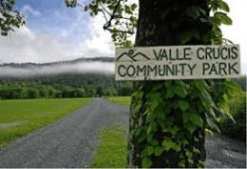 The Valle Crucis Community Park is a user-funded, nonprofit park located in Valle Crucis, North Carolina, between Boone and Banner Elk. The Park offers a variety of active and passive recreation opportunities for visitors of all ages, including a paved walking path, playgrounds, picnic shelters, access to the Watauga River, and ample open space. The Park is funded by visitors like you: 80% of our operating budget is made up of donations from our users. The remaining 20% comes from fees for special use of our facilities. When visiting the Park, the suggested donation is $2 daily. Or, make a single annual contribution at www.vallecrucispark.org/support-the-park/. (From the Valle Crucis Community Park website).